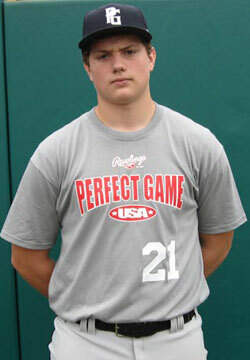 Jamie Pashuck is a 2010 LHP/1B with a 6'4'', 225 lb. frame from Christiana, PA who attends Lancaster Catholic. Strong athletic build, short easy arm action on the mound, good late life, armside run on fastball, clean and balanced delivery, 1 to 7 slider with good action, low effort with good tempo in delivery, good present strength at the plate, raw power potential, good bat speed, turns on the ball easy, short easy arm action at first, solid around the bag.